Thousands of Jordanians joined the funeral procession of a teenager shot dead by an Israeli security guard during a standoff at the Israeli embassy. The mourners have demanded authorities close the embassy and tear up Jordan’s peace treaty with Tel Aviv. The people who joined the procession chanted, “No to an Israeli embassy or ambassador on Jordanian land” and “Death to Israel” as they accompanied the coffin of the killed teenager from his home city of the city of Wihdat, east of the Jordanian capital of Amman, where a large Palestinian refugee camp is situated. The mourners were carrying pictures of the dead teenager, identified as Mohammed Jawawdeh, 17, as well as Palestinian and Jordanian flags. They also called for a “jihad” against Israel, Reuters reports. "We will go to Jerusalem as martyrs by the millions,” people chanted, according to AFP. Jawawdeh’s uncle also appealed to Jordan’s King Abdullah II, asking him to avenge the teenager’s death. 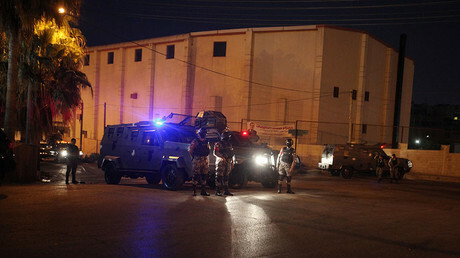 Jawawdeh was killed in a shooting incident at the Israeli embassy in Amman on Sunday. The teenager, who worked for a furniture firm, got involved in a scuffle with a security guard after he had entered the heavily fortified embassy compound to deliver an order. The guard reportedly opened fire on Jawawdeh after the teenager attacked him. The Jordanian Public Security Directorate confirmed later Monday that the guard was indeed attacked by the youth but did not confirm Israel’s account that he used a screwdriver to stab the guard. It also treated the incident as a routine crime, rather than what Israel dubbed a “terrorist attack.” The teenager’s father denied that his son had any links to extremists. On Tuesday, the Jordanian Foreign Minister Ayman Safadi told a news conference that the authorities would continue the investigation until "the truth is reached and justice is done." Meanwhile, the guard, who shot the teenager, left for Israel together with the rest of the embassy staff, including the ambassador, Einat Schlein, after the investigators heard "his account of the incident" at the embassy. The move provoked further outrage in Jordan and some other Arab countries as people on social media expressed their anger at his release and the welcome he received at home. One person wrote that the move was “a step that challenges the feelings of all Muslims.” Another stressed that while Netanyahu embraced “the killer,” the teen’s father was left to lament for his child. Meanwhile, Jordan deployed riot police to the Israeli embassy on Tuesday amid social media calls for an anti-Israeli demonstration. 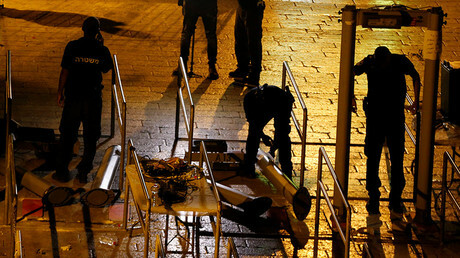 The incident took place as the tensions between Israel and Jordan were already running high following Israel’s decision to install metal detectors outside the Al-Aqsa mosque in Jerusalem. The move led to violent clashes between the Palestinian protesters and Israeli security forces that raged for several days in Jerusalem following the installation of the detectors at the Temple Mount in the Old City. Earlier, Jordan's King Abdullah II urged Israeli PM Netanyahu to resolve the crisis.